Introducing “Nature” in our cities is one of the defining trends of twenty first century urbanism, but there is little agreement about how urban nature is to be designed, planned and managed. Having overcome the antagonism between rural producers and urban consumers, we want to search for new pacts between city and nature. We believe green is much more than an aesthetic alibi, much more than a passive response to the occupation of territory. The Green Dip is an ambitious research project that will study the implementation of “green” in different climates throughout the world, showing how we can cover roofs, terraces, balconies, and facades with vegetation. What species can grow? How much soil do they need? How much water do they need and how much can they store? How much maintenance do they need and how much repair? What is the effect on the sun and wind orientation? What is the impact of height?… We want to measure how these new ecosystems derived from the implementation of “green” inside architecture benefit us. Can we evaluate/quantify ecosystem services? What do they provide us with (food, fresh water, fish, pollination…)? What can they contribute to regulate (climate regulation, disease regulation, flood regulation, store carbon, clean air, water purification…)? What cultural aspects do they enhance (aesthetic, spiritual, educational, recreational…)? What’s their direct economic value?… Finally, how will these buildings look like? How will the city look like? 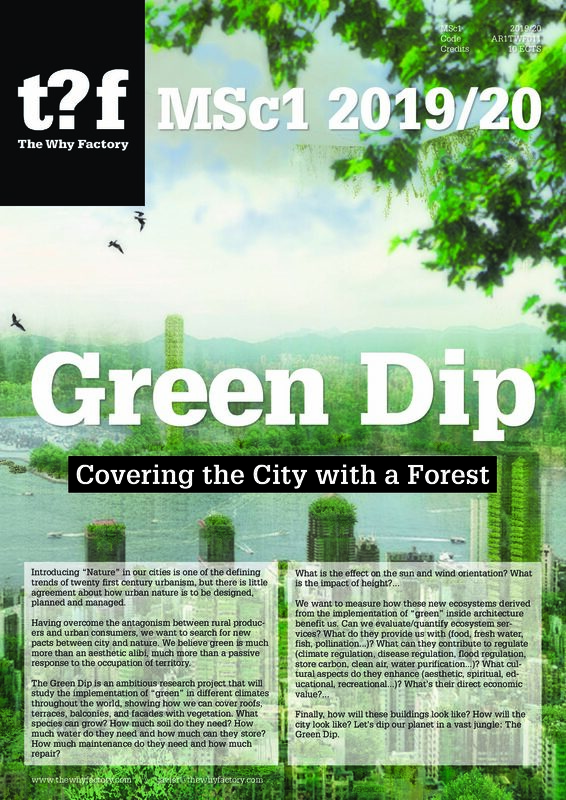 Let’s dip our planet in a vast jungle: The Green Dip.